Alice's Adventures in Wonderland. [bound with] Through the Looking-Glass, and What Alice Found There..
London: Macmillan and Co., 1868 &amp; 1872.. Two volumes bound in one. 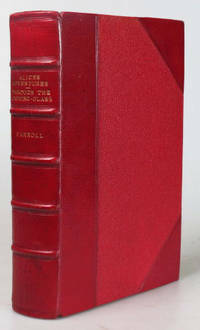 "Alice" twelfth thousand, or the first issue of the sixth edition, "Looking-Glass" first edition, first issue. 8vo. (x), 192; (xii), 224, (2) pp. Slightly later red half morocco over matching cloth sides by Maclehose of Glasgow, spine with raised bands, gilt lettered to two panels, marbled endpapers, all edges gilt. Frontispiece and 41 illustrations plus frontispiece and 49 illustrations by John Tenniel. A handsome copy. Williams, Madan, Green & Crutch, 46d and 84. Lewis Carroll's Alice's Adventures in Wonderland and its sequel, Through the Looking Glass and What Alice Found There, tell the story of a young girl in a fantasy world filled with peculiar, anthropomorphic creatures. The classic tale of literary nonsense takes the reader on an exploration of logic and absurdities. The Alice books — sometimes combined or referred to with the abbreviated title Alice in Wonderland — have been translated into at least 97 languages with over a hundred different editions. The books have also been adapted numerous times into films (both live action and cartoon), plays, and musicals. Read more: Identifying first editions of Alice's Adventures in Wonderland. [bound with] Through the Looking-Glass, and What Alice Found There.. Title: Alice's Adventures in Wonderland. [bound with] Through the Looking-Glass, and What Alice Found There.. Publisher: London: Macmillan and Co. Date published: 1868 &amp; 1872.